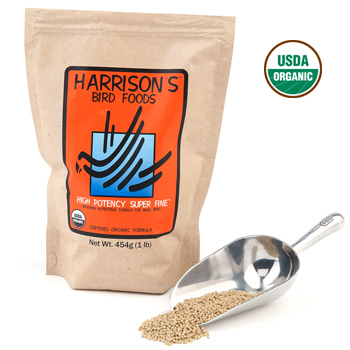 FOR USE IN BIRDS -- that are being converted from seeds or any other diet. 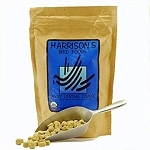 Birds should initially be fed High Potency Formula for a period of at least 6 months. -- as a year round formula for cockatiels, budgies, finches, canaries and other small parrots. -- that have special needs such as birds that are molting, overweight, underweight, particularly active, housed in a cold climate, recovering from an illness or affected by liver or kidney disease. -- that are weaning. 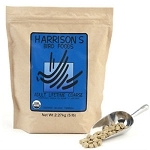 Birds should be fed High Potency Formula for at least 6-9 months. -- that are breeding. Birds should be fed High Potency Formula 1-2 months prior to the breeding period and until chicks are weaned or for at least six months before resuming Adult Lifetime Formula. The amount of supplemental certified organic vegetables and fruits may be increased until the chicks are weaned. 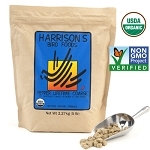 For each 2 Tbs (20 g) Formula, add « (5 g) Tbs certified organic sunflower seeds. Feeding Directions:-- feed fresh food daily. -- to help reduce waste, feed as distinct meals. 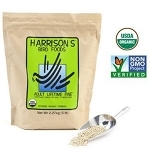 Ingredients: *Ground Hulled White Millet (Proso), *Ground Shelled Sunflower Seeds, *Ground Hulless Barley, *Ground Yellow Corn, *Ground Soybeans, *Ground Shelled Peanuts, *Ground Rice, *Ground Green Peas, *Ground Lentils, *Ground Toasted Oat Groats, Chia Seed, *Ground Alfalfa, Calcium Carbonate, Montmorillonite Clay, Spirulina, Ground Dried Sea Kelp, Vitamin E Supplement, Sea Salt, Vitamin A Supplement, Vitamin D3 Supplement, Niacin Supplement, Vitamin B12 Supplement, Riboflavin Supplement, d-Calcium Pantothenate, Pyridoxine Hydrochloride, d-Biotin, Thiamine Mononitrate, Sodium Selenite. *CERTIFIED ORGANIC INGREDIENT Guaranteed Analysis: Crude protein (min.) 20%, crude fat (min.) 12%, crude fiber (max.) 5%, moisture (max.) 10%. This bird food has been the best thing to happen to my birds. My finches were rescues from a home where they were chased with a vacuum cleaner and they were stressed and weak when I brought them home. 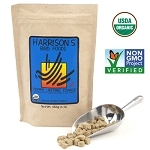 Harrison's High Potency Super Fine restored their health and they are now nearly 6 years old. They will receive this food for the REST of their lives. The Birdsafe Store also offers accurate and expeditious delivery. Love the bird seed. My parrot seems to like it too. Feathers look better, her energy is up too. Unfortunately the birds wouldn't eat it, even though I know it's good for them, I couldn't stand to let them go hungry any longer. I use this as flour in Polly's bread. Works great. 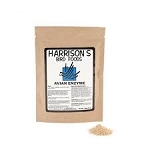 Q: I have been feeding our overweight budgie who used to be on Kaytee seed food,Harrison's high potency fine for the past 10 days and he finally started eating it and now seems to devour it! However, my question is should i be concerned if our bird seems so active and almost hyper now ! i am aware that perhaps he is feeling better but just want to know if this " hyperactivity" is normal? A: That's great that your budgie seems to be doing well on the Harrisons. You should discuss the diet with your avian vet as the high potency formula may be too much fat and you might want to switch to the Adult Super Fine formula -- but that is really dependent on your vet's advice.